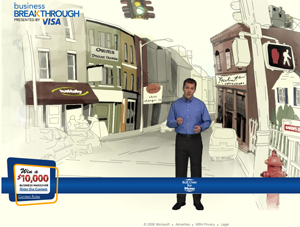 Visa and msn have teamed up for a small business makeover contest with a $10,000 prize to help companies with marketing, technology, finance, organization or team building. Nothing particularly remarkable about the contest. What’s interesting is the presentation, with a charming avatar who intros the videos. Well done! But alas, no credits provided.